It really would not be fair to follow up your bad day at work story with one of mine. That’s because when it comes to sad stories, I’ve got a hand full of spades. Every single time. Pretty soon you just won’t want to play with me anymore. You won’t ask about work. It will be the elephant in the room, the one in the corner making herself a drink. Don’t worry, its okay. I get it. I do understand. It’s hard for me, too, walking into the hospital on some gorgeous happy sunny days. You never know what you’re walking into. You never know how hard your hands will be squeezed. Or how many times your heart will be flipped upside down. How many screams or cries you will hear. Or how hard it will be to hold back the tears building a sad castle inside. You never know how many times you will need to go to the bathroom. Or how many times you will just have to keep holding it. Or if you will eat anything other than a donut and cheez-its. It’s an unpredictable environment, to say the least. But, it’s not all ace of spades sad trumping stories. Or none of us would do it. There are victorious, fist pumping small miracles happening. All around. I could also tell you of some of the most inspiring stories. The times where I’ve witnessed love in it’s purest, most raw and unconditional form. When I’ve held back both happy and sad tears as I left the room to go grab a warm blanket. Or a glass of water for a parent. I can attempt to describe to you the thrill of working on a team where each member excels in different roles but most have mutual respect and adoration for each other. And every member has the same goal: to help make things better in both gigantic life-saving ways and the seemingly small, dignity reviving ways. We all show up and hope to help kids and families overcome. We aspire to make the world inside a kid’s hospital better. If I could see that you truly wanted to listen, I would highlight all the joys and all of the many pains. The frustrations. And the necessary humor. Definitely the life-changing moments. The many heroes and heroines. You would hear all about the kids who proudly shouted “I did it!” after completing something really scary and painful. And excruciatingly hard. I wouldn’t forget to tell you of the time where I witnessed a teenage brother sit on the bed and comfort his younger sister in the most inspiring, compassionate way. A way that reminded me of my big brother. Or the time where I stood beside a father who held on so tightly to his daughter’s head and hand, never letting go, as she screamed in pain and begged him to hold her. I think she was begging him to make it stop. To rescue her. But he couldn’t do that, so he did what he could. He held onto her through the hurt. I would need to tell you of the innocent, gigantic-hearted children who say things like, “I want to stay at your house” or “do you want to go to Worlds of Fun with us?” And of the painful, heartbreaking realizations that tumble out of kids’ mouths like… “He was just a kid. And he died.” I would have to boast about the littlest interpreters who carry the weight of speaking English at the doctor and Spanish at home. Who speak for their mother or father, all the while trying to play and just be a kid. Just a few weeks ago, one sweet seven year old boy fumbled and told me, “I got lost in a word.” How perfect. I knew exactly what he meant. I get lost in words too. Especially when I try to explain what working in a hospital is like. Most people have a hard time listening. So I stop talking. I recognize that maybe you just wanted to hear something less heavy. More happy. Lighthearted. Because, if you asked this, I would answer, “Yes.” Exhale. “Yes, I do cry.” Not in front of you though. Not right here. Not right now. I cry as I turn my back to you, quick tears that never exit. I cry in the halls and bathrooms at work. Bent over using the cheapest toilet paper or paper towels to wipe them away. Or in my office. I cry at home in my kitchen into a dish towel or on the tread mill into my t-shirt. I cry in my bedroom into my pillow when my kids are sleeping or getting ready for school. Just because I can stand in this room or tell a story without crying doesn’t mean I don’t feel the utter sense of loss and pain and unfairness that you felt upon first imagining it. I’m only human. I’m actually a lot like you. We all have different strengths. And different capacities. Limits. Gifts. Yet, we all have weaknesses. Vulnerabilities. Every single last one of us. There is a completely different language that takes years and years to recognize and learn. A language we will never fully understand. And the more time you spend around this unspoken language, the more deeply you feel. In happy or sad moments. It’s the language of hurt. The language of pain. The language of unexpected life-altering circumstances. It’s too difficult to try and understand in a moment. In a conversation. In a day. It’s much too complicated. It often feels foreign, uncomfortable. You just can’t fathom the all-encompassing, overwhelming and sometimes heart-stopping beautiful feelings that accompany holding these cards. So, I will nod. Put on my best poker face. And most likely I will never let you truly know what it feels like to work in a children’s hospital. 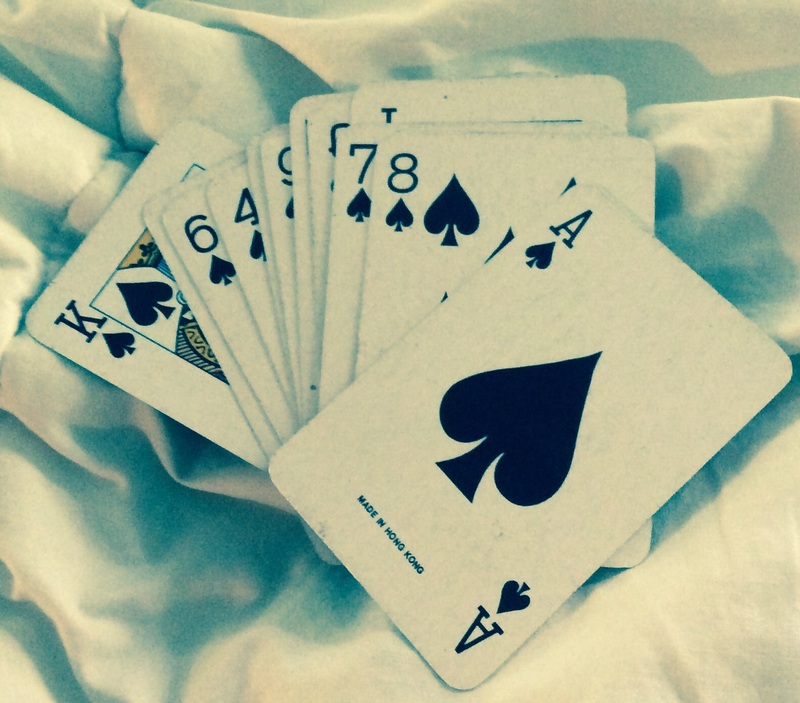 It’s easier for me to just hold my cards closely, tightly, right up next to my beating heart. Next > A Bad Hour. Or so. This…..is fantastic. I have been a Child Life Specialist for going on 13 years and can relate to every single sentence!!!! I have heard all of those questions and see the cringes on people’s faces if I start to tell a story that, to me, isn’t the worst. They don’t know the half of it. They don’t let me most times get to the most beautiful part of the stories because it’s too sad. But if they’d just wait…they’d “find the beautiful” in that moment….just like I do every day. That’s my mantra..and how I walk back in each day to do it again. I know exactly what you mean. Thanks for sharing. And thanks for all of the dedication and hard work you pour into the lives of those you work with. Awwww … Crap. Amelia you don’t know me. I thought Dani Dillard wrote your post. She put a link on FB to your blog. I apologize! I thought I was writing to her. But the fact remains … Thank you for what you do! The world is a better place because of you! I would like to go to a dinner party with you and hear all about it….Thanks for giving words to all that is deep within me. You are amazing. Thanks, Jennifer. We should arrange a dinner party. That would be refueling and good for the soul. Thanks for the work that you do. Thank you for bearing the weight of others’ pain, in addition to carrying your own. It can be so hard to feel like others don’t get it. Hopefully, you have experienced the overwhelming sense of gratitude and perspective that this work introduces. Keep doing what you’re doing. You’re helping people in ways you may never know, in some of the hardest times they will ever experience. Thanks for your support. I am one of those families whose kid you (and others) have cared for, and I thank you from the bottom of my heart. Especially for your tears, because sometimes it helps to know that you are crying too. So much wisdom summed up in a few words. All of us have our have our heartbreaks, pain and victories and triumphs but something about seeing innocent children going through these trials and being so brave and honest and scared just doesn’t seem bearable. But God bless the caregivers that are there for to aid and comfort. For in each moment is a lifetime of meaning for such a young life. Each moment spent in compassionate care is a true measure of our humanity and respect for the value of each life that is touched. I pray for strength and such bravery where I can help pay the debt we all owe in the end. Wow. I don’t think I’ve ever read something that put into words what it is like to be a pediatric nurse. Thank you for such a soul-revealing post. Please know you are expressing what so many of us have felt. Thank you for reading and commenting. Thanks for the work that you do. It’s truly an oddly disguised gift to tend to the littlest and most brave souls in some of their darkest hours. I know you carry the weight of the work home with you. Take gentle care of yourself too.